Zenobia was a 3rd-century Queen of the Palmyra who led a revolt against the Roman Empire. She claimed descent from Cleopatra and the Ptolemies and her mother may have been Egyptian. Zenobia became the wife of Odaenathus, king and ruler of the Roman colony of Palmyra in present-day Syria, and accompanied her husband, riding ahead of the army, as he expanded Palmyra’s territory. When her husband and his first born son were assassinated, Zenobia acted as regent for the second son, assuming the title of “Augusta” for herself, and “Augustus” for her young son Vaballathus. In 269-270, Zenobia and her general, Zabdeas, conquered Egypt, which was at that time ruled by the Romans. When the Roman prefect of Egypt objected to her takeover, she had him beheaded. 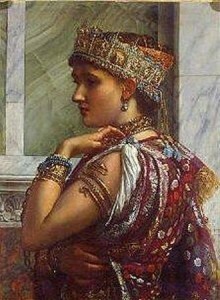 After this success, Zenobia personally led the army as it’s “warrior queen.” She went on to conquer territories in Syria, Lebanon and Palestine, thereby creating an empire independent of Rome. While the empires co-existed for a time, this part of the Roman Empire was a valuable trade route and eventually Zenobia cut off grain supplies, which caused a bread shortage in Rome. The Roman Emperor Aurelian reacted to this affront on the authority of Rome and sent his army to meet Zenobia’s near Antioch, where his forces triumphed. Zenobia and her son escaped to Palmyra, and when Aurelius took the city escaped again, only to be captured near the Euphrates. Vaballathus is presumed to have died on his way to Rome and Zenobia was sent to Rome as hostages and paraded through the city, in golden chains. What happened to Zenobia after that is uncertain. She may have committed suicide, died in a hunger strike; been beheaded by the Romans or married a Roman senator. This final possibility has it that Aurelian freed Zenobia and granted her an elegant villa where she lived in luxury and became a prominent philosopher, socialite and Roman matron. Zenobia and the senator reportedly had several daughters who married into Roman noble families.